Panoramic, endless Ocean white water and Point Sal to Point San Luis, Avila Bay, Pismo Beach VIEWS from this fabulous BEACHFRONT RETREAT. Savor the views in the relaxation of your own home. Life at the beach, a beautiful stroll, with your soul at sea and feet in the sandy shoreline. 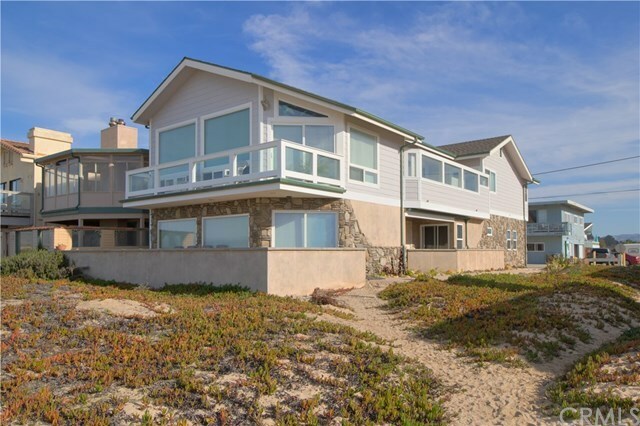 This treasured 3000+/- sq ft home is located at historic Oceano Beach. Custom built, quality designed throughout with valued beach living in mind. Perfectly designed two level living, for generational comfort. Proudly situated on a larger corner lot, next to adjacent open space which allows additional light and airy feel. Large picture windows and beautiful entry to the family room and more panoramic views, gas fireplace, surround- sound TV. Gather around the beautiful old west style mahogany bar for entertaining, or outdoors on the patio the one of a kind Pacific Oceano sunset creating your OWN coastal memories. Two-bedroom nicely decorated large en-suites on this level, inside laundry room, two car garage. Upstairs offers a private upper deck highlighting high dune and mountain views with gas BBQ. Sweeping views from substantial, functional kitchen offers granite countertops, island, well-built cabinets and drawers, central vac. Alluring upper-level high ceiling in living room, gas fireplace, far & wide views, two additional large comfy bedroom en-suites plus one-half bathroom. This lovely home is a licensed income producing vacation rental home - sleeps 10-12.